Converters are used to convert from one communication protocol to another such as RS232 to RS422. Repeaters are used in circumstances where it is necessary to extend the distance of a network. We offer a wide range of serial and USB converters, repeaters and hubs for a variety of applications. 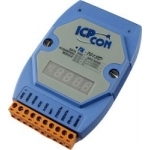 USB-RS232 or RS485 / RS422 Conversion, RS232 to RS485 or RS422 conversion. RS485/RS422 Repeaters add isolation and extend networks. An RS485 Hub unit is used to create network redundancy or physical layout. The I-7520AR is a high-performance low-cost RS-232 to RS-422 or RS-485 isolated converter packaged for convenience in a compact DIN rail mounted unit.